Our BA (Hons) Fine Art final year students raised just under £2,500 at this year's Fine Art Auction, which will be put towards their Degree Show exhibition in June. 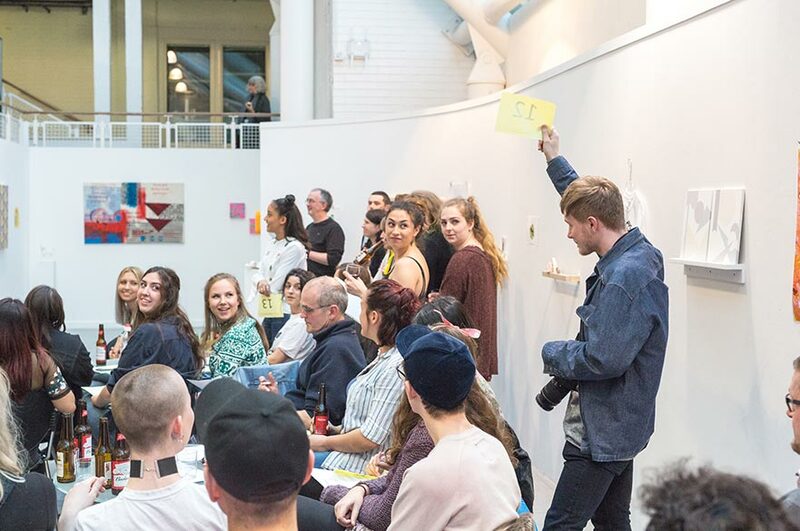 The Fine Art Auction, now in its sixth year, has become a real highlight in the School of Art & Design's calendar. It presents a great opportunity for students to raise money for their Degree Show, while providing a lively social event for students, staff and the general public to enjoy. Taking place in the Bonington Atrium, some fantastic lots were up for auction this year. The 39 artworks were donated by current students and staff, including Sean Cummins, Derek Sprawson, Rob Flint and Andy Pepper. The students also led a hugely successful raffle, along with a drinks reception and BBQ. “Flat Projection”, a painting by NTU Fine Art tutor Andy Pepper, sold for the highest price on the night, raising £215. Student organiser Hannah Parikh said: "Organising an event on this scale was challenging and new to all of us, but we've had really positive feedback and gained great experience all round". Fellow student Demi Levy added: "It felt really rewarding to be a part of the Fine Art Auction, all the hard work paid off and we had a fantastic turnout, it will always be a memorable event”. Another member of the student committee, Chris Preece, said: "Putting on the annual NTU Fine Art Auction was a group effort, and curating the auction exhibition together was the most fun, interesting and challenging part I found”. Find out more about this year's Degree Show, which is on display to the public from Saturday 3 - Saturday 10 June 2017.